Students of CEDAT together with those from Aalto University have come together to develop solutions to problems in and around Makerere University under the Problem Based Learning (PBL) umbrella. 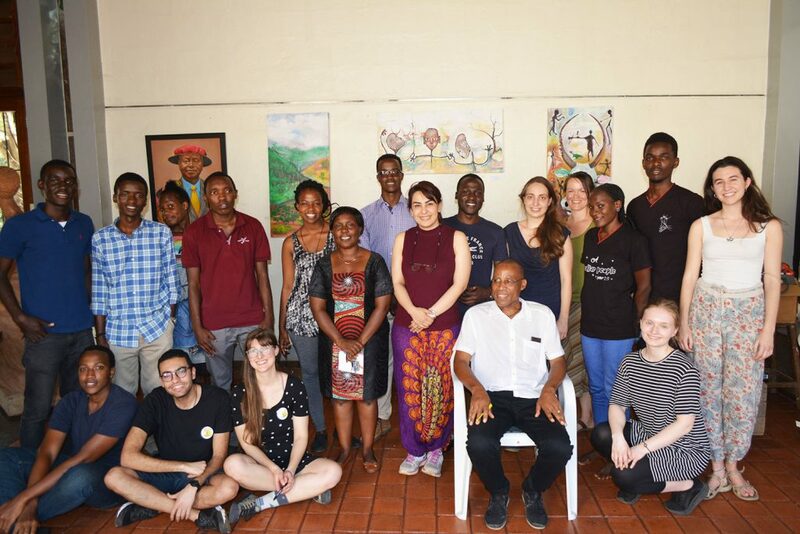 The team from Aalto University arrived in Uganda on Saturday 2nd February 2019 and left on Thursday 28th February 2019. The students formed 3 groups that worked on different solutions to current and emerging problems in the University. The 1st group looked at developing a sustainable green solution for handling greywater instead of water treatment. Greywater refers to the waste water from washing clothes, dishes and showering. It may contain traces of dirt, food, grease and some household cleaning products but not faecal matter. As a result, it is easily recyclable for reuse. The team, that dubbed themselves Wet Technick proposed to develop a constructed wetland at Africa hall as their first demonstration site. They will develop the wetland from small plumice rocks and perforated bottle caps. The hope is that the constructed wetland will act as a bio filter and remove a range of pollutants such as organic matter, nutrients, pathogens and heavy metals from the water. To ensure adaptation and sustainability of the wetland, Wet Technick will be involving the end users (students of Africa Hall) in the construction process to create a general sense of ownership amongst the population. The second student team is developing a water filter that can sustainably used by communities that don’t have access to safe and clean drinking water. The design of this filter will be easier to assemble and will use Moringa Olifera seeds, coarse sand and bamboo activated carbon will actively absorb impurities in water much better. The team developed a prototype of the water filter, which they named the “Vepo Filter” and are carrying out laboratory tests on the water filtered through it in order to come up with final specifications with considerations of what works better, for the worst case scenarios. Both teams carried out field visits to learn from existing technologies and organizations doing work in the fields they are researching. They visited Seeta High School Green campus to learn more about how to set up and maintain a constructed wetland. The team also visited Spout, a factory based in Nakawuka district to learn more about the water filters they make using ceramics and obtain insights into their envisaged ideas on the water filter. This was followed by collection of water samples from the Kasambya valley dam in Mubende district. The third team worked ib developing a co-learning environment in the University that would be used as an innovation space. This would be a dedicated space for students to talk about innovations. This team identified the Makerere Entrepreneurship and Innovations center as a viable space for this activity. The teams working on the vepo filter and constructed wetland will continue with their projects throughout the rest of the semester. By the end of the semester, their projects and their respective results will be presented to the public and other stakeholders for evaluation and participation. The 3 teams are made of Engineering students, Quantity Surveying students, Architecture students and students of Industrial and Fine Art. The project seeks to bring students from different programs together to address challenges faced in their communities using collaborative approaches.